Russell Brand is a famous British comedian but he has yet to break big in North America and it’s certainly not for a lack of trying. He had a memorable supporting role in Forgetting Sarah Marshall (2008) and an infamous hosting gig for the 2008 MTV Video Music Awards. This DVD presents a stand-up comedy show he shot for Comedy Central in New York City. Brand comes out to the strains of “Supersonic” by Oasis and launches into a routine about being famous in the United Kingdom versus America. Naturally, he talks about his lack of recognition and his MTV VMAs gig, including the ridiculous promotional ads he did with L.L. Cool J and Britney Spears. Brand pokes fun at how MTV executives tried to market him as an edgy comedian. Through observational humour, Brand candidly talks about how the audience at the VMAs did not get his style of humour. He shares some of the bits that MTV would not let him say, including what a hypocrite Kanye West is. Brand also takes the time to address some of the insane death threats he received based on this appearance. He points out how silly they are and then pokes fun at them. This stand-up special gives Brand the opportunity to do his thing as he struts the stage, commenting on several topics. 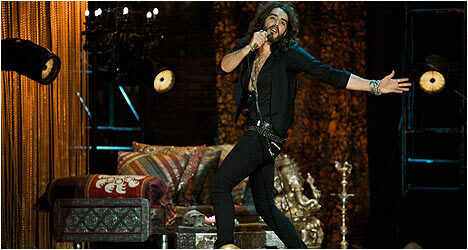 He delivers a very energetic concert which is designed to show the comedian in his natural environment. This concert probably won’t convert many new fans but for those who enjoy his comedic stylings, you should enjoy it. “Loose Cannon Drunk Girl” is outtakes from his concert where he repeatedly deals with a rabid female fan in the front row. “An Englishman in New York” sees Brand let loose in Times Square riding around in a limousine with his buddies. He walks around the streets spontaneously interacting with people who have no idea who he is except that he may be famous. “The Notorious 2008 VMA Monologue” is included in case you missed it when it aired on MTV. Here it is in all of its infamous, uncomfortable glory as many of his jokes go over like lead balloons. He takes a few digs at the Jonas brothers which go over even worse. At many points, you can almost hear a pin drop and it often looks like Brand can’t wait to get off the stage.